The oldest international pageant in the world is happening again in China! Reigning Miss World 2017 Manushi Chhillar of India will be passing on the crown to her successor in China in what will be the ninth time the country is hosting the prestigious pageant. The first one was in 2003 in Crowned of Beauty Theatre, Sanya. On 2nd March 2018, Chinese Media Sources have reported that the Miss World 2018 pageant will be hosted again by the New Silk Road Group in China. 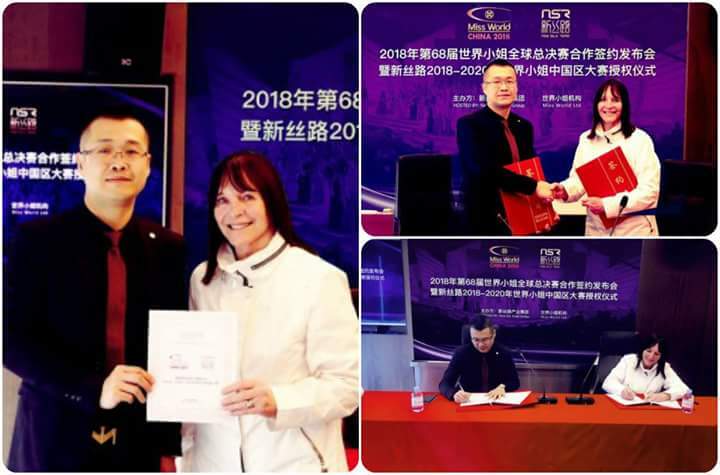 On February 23, the new Silk Road Industry Group and Miss World Organization Conference held in Shenzhen, the two sides signed the 68 Miss World Finals 2018 Cooperation Agreement, announced the 68th Miss World Finals will once again be held in China. At the same time, the Miss World Organization authorized the new Silk Road to host Miss World China in 2018, 2019 and 2020. At present, the preparation for the 68th Miss World contest has officially started. The selection of the Miss World finals venue is also on the upsurge. In many popular candidate cities, Beijing, Xi'an, Dalian, Xiamen, Shenzhen, Haikou and Sanya call out Highest, who ended up we finally wait and see! In 2018, the new journey has kicked off. New Silk Road Industries Group will again join hands with Miss World to offer the world a more fabulous Miss World China Finals and the Global Finals. This beauty contest will be a perfect collision of world culture with Chinese culture and a perfect fusion of the national characteristics of all countries in the world.